ALOHA FROM LIME MEDIA HAWAII!! Lime Media Hawaii is a Honolulu Hawaii based publisher of digital and print comics, games and game accessories. We were founded in 2002 by William "Doc" Grant. Our mission is to make good fun general audience comics. 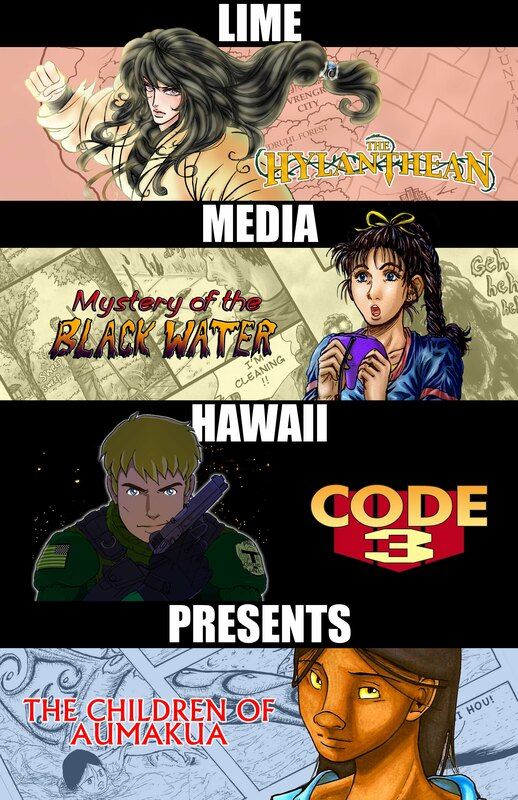 We published the digital ebook comic Hawaii Star Manga Project in 2010 and the Hylanthean Gaiden graphic novel in 2013. HSMP has over 8 million readers to date. Our newest project is Lime Media Hawaii Presents, featuring several unique series. Each offers a unique reading experience, and we are proud to have an all female art and production team! Banner ads LMH web page and some web comic features $45 each page on space available basis. We will also be releasing the Rules of Thumb generic universal gaming products and accessories in the coming year.